A teachers strike against the Los Angeles Unified School District can go forward on Monday, Jan. 14, a judge ruled Thursday. More than 30,000 members of United Teachers Los Angeles had already postponed their planned work stoppage for a few days amid legal confusion over whether their original strike date would hold up in court. But L.A. Superior Court Judge Mary Strobel appears to have ended the confusion. In court filings, attorneys for the school district had asked the judge for an even further delay in the strike date. They argued UTLA leaders had botched the order in which they rolled out their strike plans, which violated the original contract and entitled the district to even more time to prepare for the work stoppage. But Strobel rejected the argument, saying a Jan. 3 email was enough to serve the district notice that the union intended to walk away from the contract. "The district request comes quite late in the sequence of events," Judge Strobel said from the bench. The district is considering asking an appellate court to review the decision, according to LAUSD deputy general counsel Alexander Molina, who also noted the judge didn't rule whether UTLA violated the contract. 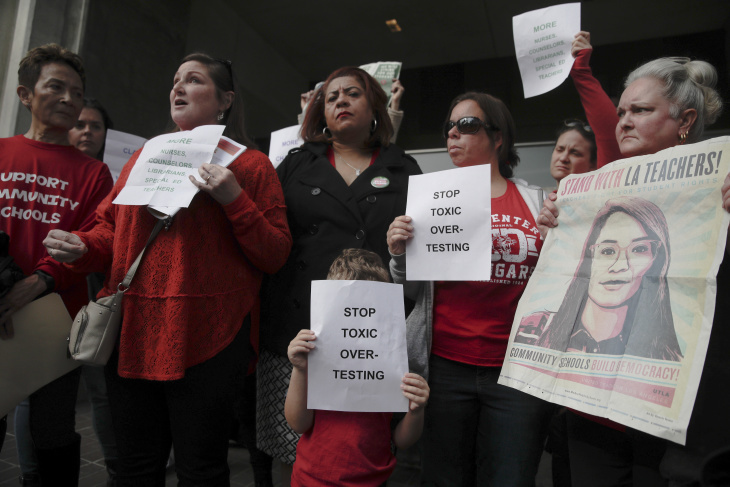 UTLA and LAUSD negotiators met Wednesday, making little progress. The bargaining teams are set to meet again on Friday morning; it's possible negotiations could continue over the weekend.